Sumer is coming along great. The design feels close to complete, with only relatively minor changes to come. We have a ton of work to do on the art, UI, narrative, tutorials, and audio, but it’s good to know that we have such a strong core. Crystal Brawl has undergone major refactoring and optimization in order to make it run at an acceptable frame rate on the Wii U. It’s mostly up and running, though we have some significant bugs to work out. We’re looking at ways to fund full-time development so we can finish it in a reasonable time frame, we’ll see how that goes. We’ve also started to design a single-player mode – exciting! Nika has also been getting refactored, so there’s nothing too exciting to report, except that the AI is definitely making progress. It hasn’t become sentient and gone on an apocalyptic rampage just yet, but it can move pieces around the board in something approaching an intelligent pattern. Lots of work still to do, but we’re hoping to have a decent AI (as well as final in-game UI) in time for the Playcrafting Spring Expo on April 29th. Fingers crossed! Otherwise, I had a lovely GDC as a third-time Conference Associate. I’m graduating in a couple months, which is both exciting and frightening. Hopefully I’ll have some news for my summer plans in not too long, but until then I’ll just have to wait and see. Until next time! 1. Sumer (temp title): A video game inspired by board games, we’re calling it a “worker placement platformer” – Mario meets Settlers of Catan, or (more accurately) Agricola meets Killer Queen. Co-designers include Misha Favorov, Sig Gunnarsson,and Geoff Suthers. Art by Adam Alexander, sound by Seori Sachs. Not the last you’ll hear of Sumer! 2. Jefferson: A deck-builder using a standard deck of cards. Designed solo. 3. Lia Frank’s Rainbow Road: A real-time math game using a board and a standard deck of cards. Designed with Jesse Fuchs and Elyse Lemoine. 4. Train-a-saurus Wrecks: A game for preschoolers where you stack dinosaurs onto an electronic train. Designed with Vanessa Briceño, Misha Favorov, and Geoff Suthers. 5. Ratnakara: A Euro-style board game where you play as a merchant captain in the 1400s plying the Indian Ocean. Our final project, and a pretty fun game! Designed with Bruce Lan, Wynn Chen, and Jason Schoenfeld. I also wrote a feature on Keith Nemitz, founder of Mousechief and creator of 7 Grand Steps and Dangerous High School Girls in Trouble!, for Chris Plante’s’ journalism class. With Studio Mercato, the most exciting news was showing Crystal Brawl at the Smithsonian American Art Museum in early December. We’ll also have it at MAGFest later in January. As for Nika, you can purchase the board game version online here, and we’ve been putting the app on all kinds of new platforms as well as working on the AI and polishing up the look. I expect it’ll be available for release within a couple months. That’s about it! See ya next time. Like the title says. We’ve put it up on Philomela, a lovely free Twine hosting site. Play it here and tell ya friends! Okay! It’s been well over a month, meaning I have been terribly negligent in my blog duties. So let’s get right into it! Most of the summer was occupied by the amazing Critical Hit program at Concordia University’s TAG Lab. Each of the 15 other participants were phenomenally talented and wonderful people, and I’m honored to have spent 10 weeks making games alongside them. 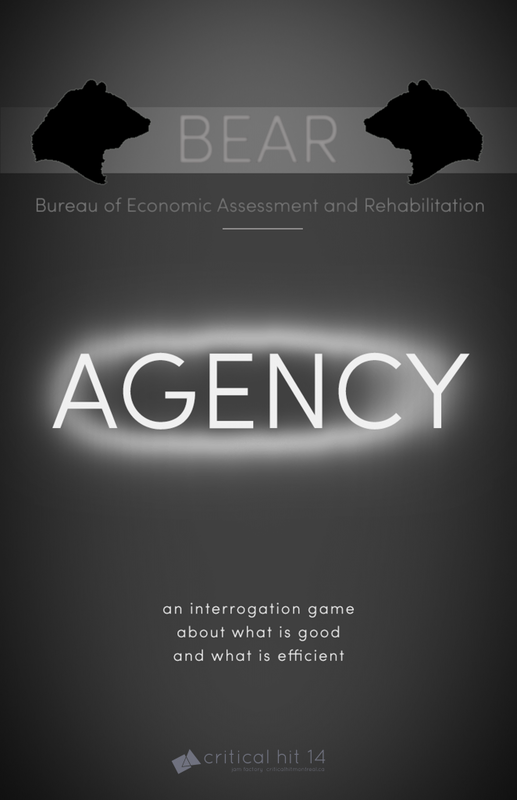 I ended up working primarily on Agency, a text-based game built in Twine that explores themes of morality, necessity, and bureaucratic obfuscation in a not-so-distant-future America. You play as a government Inspector tasked with extracting information from a suspect. It will be online very soon, and I’ll post a little addendum when it is. I created the game alongside fellow NYU MFA student Pierre Depaz, and under the indispensable tutelage of Leanne Taylor and Jonathan Lessard. On other fronts, Crystal Brawl was accepted into the Boston Festival of Indie Games (September 13 at MIT). Geneses, sadly, was not, but we have some good hypotheses as to why – more to do with difficulties in UI and teaching the rules than with the quality of the design, in which we’re completely confident. Still waiting to hear back from IndieCade about those two and Nika, but that should be coming soon. Additionally, Crystal Brawl will be showing at two festivals in the near future: lwlvl this weekend in Williamsburg, and Maker Faire NYC September 20-21 in Queens. We’re going as part of Mark Kleback’s wandering indie arcade carnival Deathmatch by Audio, and both events look like they’re going to be awesome. Hope to see you there! Lastly, team assembly and preliminary design work have begun on my MFA thesis project. I won’t say much for now, but stay tuned. It’s gonna be good. Critical Hit just made the transition from 1-week game jam projects to a 6-week final game. Last week I worked on the twitchy 2D physics platformer Shimmy with Hamish Lambert, Ben Swinden, and Ana Tavera Mendoza, which we showed off at CH’s big public playtest/party on Friday. People loved Shimmy, but ultimately I decided to return to Welcome, Inspector for the remainder of the program, along with Patrick Chan, Pierre Depaz, and Tuuli Saarinen. As a game primarily concerned with information, hidden roles, and social dynamics, it’s a difficult design challenge I’m eager to tackle. We’ve decided to make it a full-on installation, which will allow us to focus on atmosphere and set design as well. This does mean the game will be harder to set up and run outside of CH, but we believe it’ll be that much more effective this way for those who do get to play it. More updates coming throughout the summer! 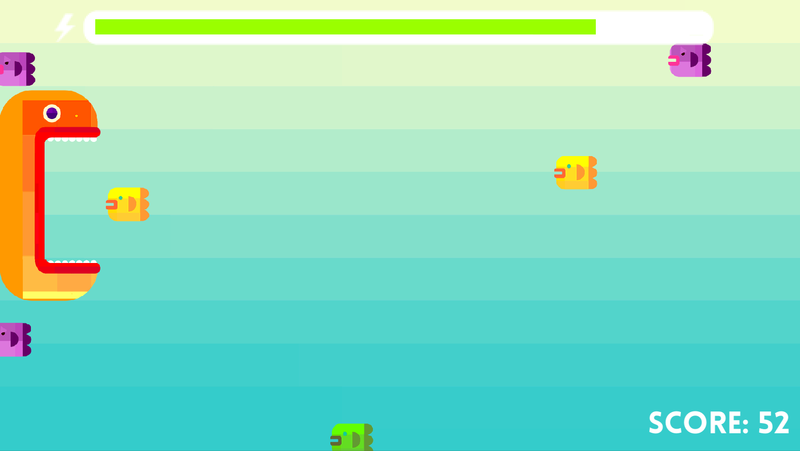 Chomp: 2 players share a single controller, each manipulating one jaw of a fish as you swim through the ocean. When you see a good fish, try to chomp down on it by moving the jaws together at the same time. I’ve mostly worked on design, though I also wrote the main menu music. Zlata Barshteyn is the programmer and project lead, Trevin Hiebert is doing sound design, and Jenny Jiao Hsia is our artist. For Andy Nealen’s Minimalist Game Design class. Bandit Kings (temporary name): A CCG ( collectible card game) where you swap cards permanently during play. Whatever cards you end the game with, you keep! 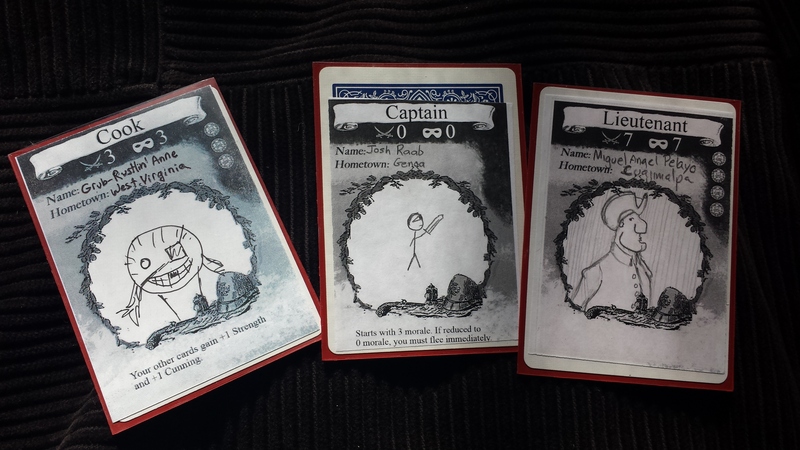 When you create a deck, you customize your cards with names and pictures. You’ll use these bandits and treasures to battle opponents and snag their best cards. Each card has a “Glory” rating which is used to assess your deck’s prestige – the more Glory you have, the better you’re doing! Designed with Misha Favorov, Char George, Elyse Lemoine, and Maria Saint Martin for Eric Zimmerman’s Game Design 2. 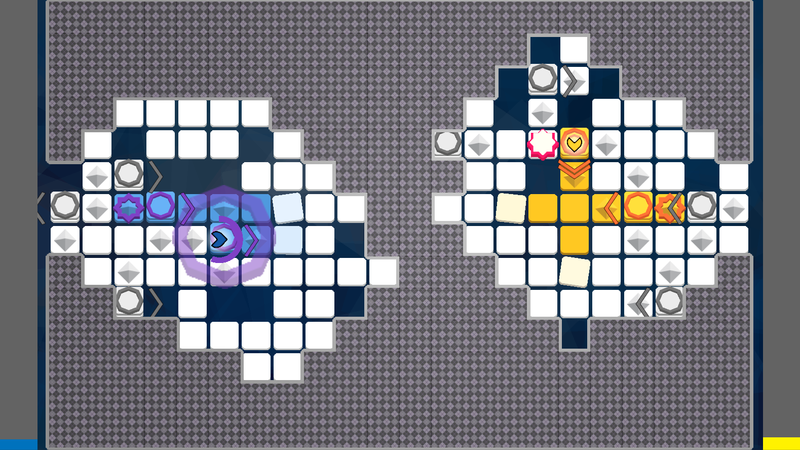 Geneses: An abstract real-time strategy game where your only resource is time. As a fledgling god at the end of a cosmic cycle, you strike out across the world to discover the Altars of the old gods, which house their sacred power. You build holy Beacons to spread your influence across the land, and you win by connecting the Altars you find back to your home base or “Genesis”, slowly adding their power to yours. In other news, I received proofs of the materials for Nika and finalized the dimensions of the pieces. Aside from one minor issue, everything looked great and appears to be on schedule to ship in July. 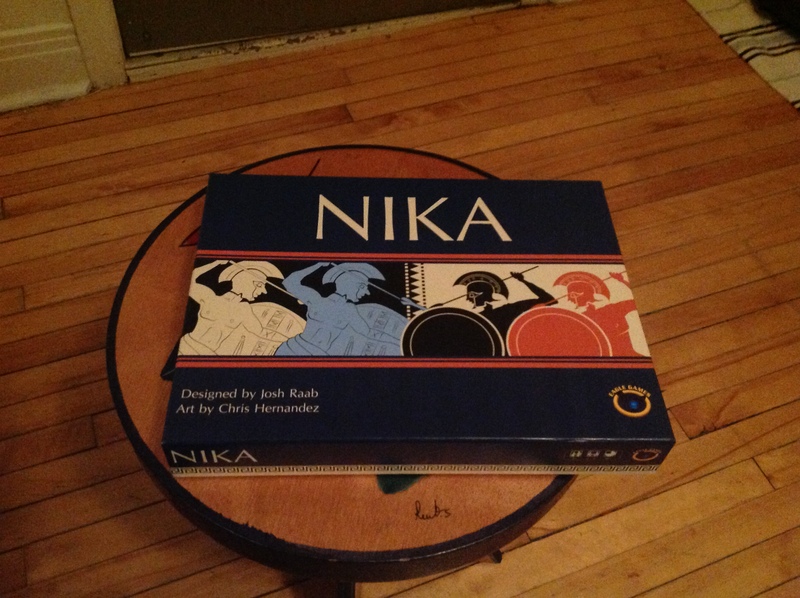 I also submitted Nika (as a board game) to IndieCade this year, so, fingers crossed! Finally, I hope to know soon what my summer plans are. I’ll let you know when I know! Today I head to San Francisco for GDC, where I’ll be volunteering for the second year in a row. If you’re there, you can see me in my “emergency cone orange” volunteer t-shirt. I had an absolute blast last year and this year should be even better. My main conference goal (when not on duty) will be to find a summer job or internship at a game dev company outside of NYC. I’m also hoping to show off Nika and Crystal Brawl and spread the word about Studio Mercato, plus the general stuff like meeting new people, seeing old friends, and learning more about design. If you, person from outside NYC who probably received a business card from me during the conference, might be interested in hiring me for the summer, drop me a line at joshr2121@gmail.com. As a quick reminder, I’m an MFA grad student in game design with plenty of design experience and some technical proficiency. At the very least, thanks for taking the time to remember me and check out my site! On another note, here are two nice, quick reviews of Nika on Intel’s site and PopMatters. Cool!